3.6 / 5 Score from 4 reviews. Location: Hotel Crystal is situated on the bank of one of the beautiful Smolyan Lakes just off the main Pamporovo - Smolyan road at the entrance to the town. The hotel provides a unique opportunity to relax in comfort and enjoy the breathtaking views across the lake and the surrounding mountains overlooking the town of Smolyan in the valley. 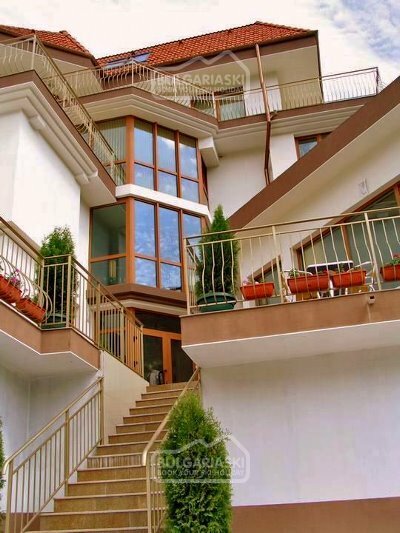 The location is extremely convenient - the international ski resort Pamporovo is only 10 minutes away while the regional centre Smolyan is a mile down the road. Whether the purpose of your visit is skiing, hiking, fishing, property hunting, business travel or just exploring new places, Hotel Crystal offers all year round an excellent standard of accommodation and service at very competitive prices. Accommodation: Hotel Crystal is a family hotel featuring 30 double rooms and 3 maisonettes. Each room features central heating, cable TV, mini-bar, private bathroom with WC, shower cubicle, bath or Jacuzzi and everything else necessary for comfortable rest. Some rooms have balcony while the maisonettes also have a second bathroom with shower and WC. All double deluxe rooms, apartments and the maisonettes have double sleeper sofa allowing accommodation of up to 4 people. The furnishing meets all modern quality and safety standards. Conference facilities: The hotel offers multimedia equipped conference room for up to 20 people. The guests can also use free of charge unlimited high speed wireless internet access and enjoy the magnificent views from the large panoramic terraces. Entertainment: The hotel offers swimming pool, sunbeds, fitness centre, sauna, massages. Hotel facilities: There is a secure private parking. 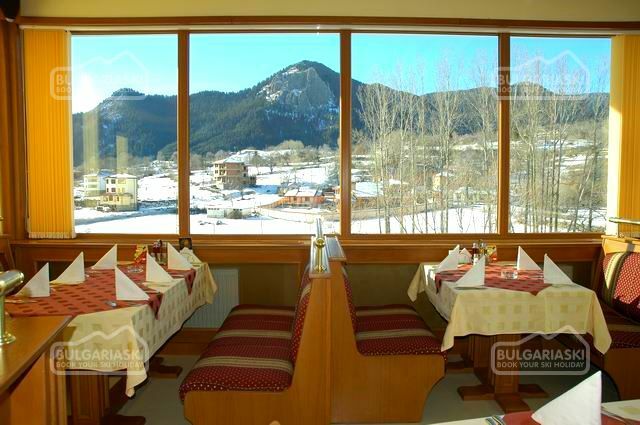 Free transport is provided to and from the ski slopes of Pamporovo. Also the services of professional ski and snowboard instructors can be available on request (local charge payable). Wine and Dine: The hotel offers restaurant with 75 seats. 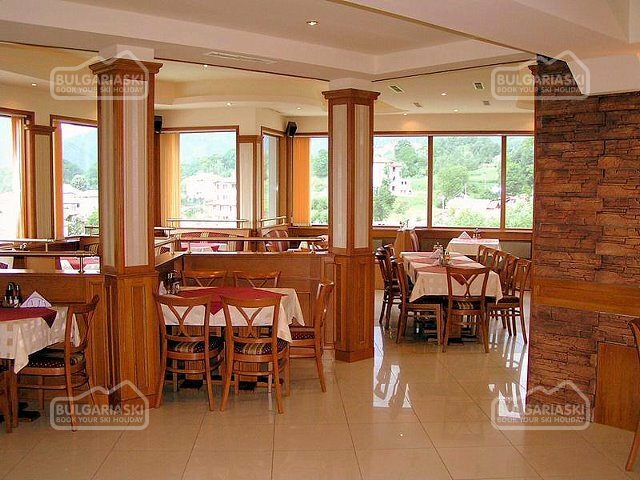 In the pleasant atmosphere of the restaurant you can experience the traditional Bulgarian hospitality and enjoy the local dishes and international cuisine along with some of the best Bulgarian wines and spirits as well as quality imported drinks at genuine bargain prices. We stayed for a week in January 2008. were made to feel very welcome, the rooms were spotless and the a la carte menu second to none. Would highly recommend this hotel to anyone. 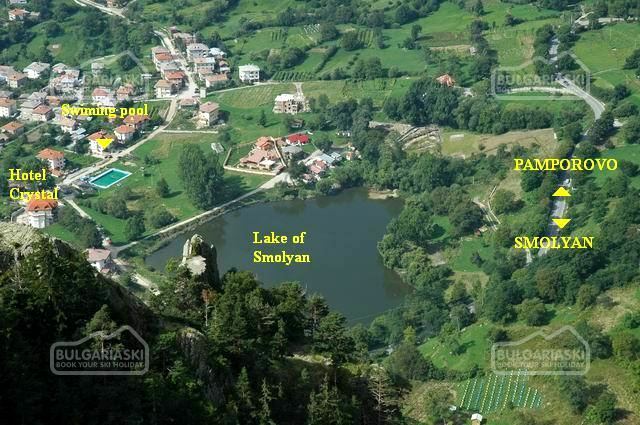 Please, post a comment on Hotel Crystal in Smolyan. * Cancellations can be made, providing details of this are received at least 1 working day prior to check-in day - cancellations made after this period will incur a fee equivalent to the cost of the first night's accommodation.